No good food comes from a dirty facility. Keep your facilities and restrooms looking sharp at all times with Republic Master Chefs’ line of dust control mats, complete restroom supplies, and other helpful implements. We have selected a high-quality supply of mats to meet your needs in every area of your business space, along with other cleaning supplies and restroom products that we will consistently deliver to you so you never run out of the necessities. Whether you’re looking for mats to keep your employees comfortable while standing on the job, mats to market your business’s logo or simply to keep the dirt away, Republic Master Chefs has the quality customizable supplies your restaurant needs. When you give us a call, we will set up a free consultation to evaluate what supplies you may need, from uniforms to tablecloths to floor mats. We’ll send you a free quote so that you can make the best decision for your business! It’s one thing to get a quality supply, and it’s another thing to have to manage it yourself. When you get your dust control mats and restroom products from Republic Master Chefs, we make sure to maintain your mats and restock the items you require for your restroom supply. Mats help keep your employees and guests safe from slip-and-fall accidents, which helps you save on legal costs. They also protect your floors from dirt and grime, in turn helping you bring in more customers. 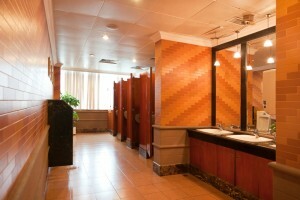 Proper dust control and restroom supplies also help keep your business space clean. And ultimately working through a service where you don’t have to constantly look for and change out your items helps you save time and money. We pick up and deliver your supply for you, so you never need to worry about going out of your way to come to us. All of our deliveries are on-time and accurate so you get all of the products you need at the time you’re expecting them. As a TRSA-certified Clean Green linen service and provider that participates in the Laundry Environment Stewardship Program, our company works hard to make sure that the products that you get back are laundered up to standard without carrying a heavy carbon footprint. Providing quality products, processes and services to restaurants is important to us at Republic Master Chefs. We know finding a supply that meets your business needs and then maintaining it can be time-consuming and draining. That’s why we make sure to keep our services convenient and easy to use – so you can run your restaurant without having to worry about the little things like your floor mats. How do we do it though? How can we maintain quality, speed and accuracy? We do this and more through our quality tracking system that accounts for every item we’ve provided in your inventory. By knowing where your items are in the laundry process, how many items you need and which items are yours, we can make sure that all of your products get back to you in excellent condition, and without any losses, surprise costs or delivery mistakes. To get started with our experts, give us at Republic Master Chefs a call today at 800-640-2433 for your free consultation.